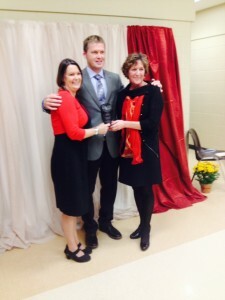 Michael Todd, Stone Tree’s director of operations, presented the Hospitality Award to Marnie Weiss and Marg Miller, owners of Red Hot Catering. Owen Sound’s Chamber of Commerce, which is celebrating its 150th year, hosted the 23rd Annual Business Excellence Awards Gala last week at the Bayshore. ‘Based on comments received, it was the best ever,’ says Chamber President and CEO, Bert Loopstra. ‘It’s humbling for us to be receiving an award for something we’re just doing,’ says Marc Brooks, Property Manager of Legacy Ridge & Stonetree, companies operated by Balner Golf Ltd who won the Environmental Stewardship Award. ‘It’s a struggle to stay in business from one day to the next, so having someone notice makes it worthwhile.’ This is Balner Golf Ltd’s second time winning in the 17 years they’ve operated in Owen Sound. Less than three years ago, they brought their environmental practices to Legacy Ridge. Since then, Brooks and the staff at Balner Golf Ltd have reduced the amount of pesticides used at the former Owen Sound Golf & Country Club by a staggering 70%. ‘We’re trying to do the right thing for the environment and it’s great to be recognized for that,’ says Brooks.